High wind advisories are in effect this morning at many Bay Area bridges and highway locations, according to the California Highway Patrol. Meteorologist Rob Mayeda and Marianne Favro report. High wind advisories are in effect this across the Bay Area, specifically bridges and highway locations, according to the California Highway Patrol. The CHP has pinpointed the Antioch Bridge, the Bay Bridge, the Altamont Pass and the area around eastbound Interstate Highway 80 at northbound Interstate Highway 680 with high wind advisories. In addition, northerly winds of 20 to 35 mph can be expected throughout the Bay Area, with local gusts exceeding 50 mph likely, according to the National Weather Service. When driving in heavy winds, motorists should anticipate gusts. Drivers should keep an eye out for larger vehicles such as big-rigs, which may not be able to stay in their lanes during a gust. Also, drivers should keep a firm grip on the wheel. Cal Fire is also worried the heavy winds will cause a repeat of the North Bay fires. "At an instant, everything you have could be jeopardized and threatened - and make sure you do your job as a citizen," said Cal Fire Captain Chase Beckman. Cal Fire officials are asking people to avoid any outdoor cooking or burning over the weekend as well as being cautious of where you throw your cigarette buds to avoid any fire accidents. The heavy wind conditions have also left over 260 customers in Palo Alto without power Saturday. 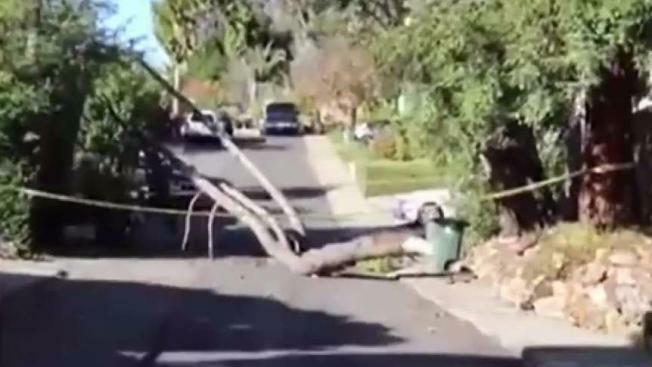 Dozens of people in Vallejo also experienced power outages after a tree branch crashed into power lines from the heavy wind conditions. "It snapped off a power line and PG&E and tree crews are coming out to remove hazards," said Jason Goodner from the Vallejo Fire Department. Vallejo citizens were not the only ones affected, in Antioch, the high winds sent a tree crashing down into a home. That tree also caused power outages in the area. The breezy conditions, as well as low humidity, have led to very elevated fire weather concerns, with a red flag warning in effect in the Bay Area until 10 a.m. Sunday morning, according to the National Weather Service.